Asif Ali - Zama Mazreen marriage date is set for 26th May 2013. As the wedding date is fixed, malayalam actor Asif Ali would tie knot with his fiancée Zama Mazreen on 26th May with the blessings of their parents, relatives and close friends representing the film fraternity. The engagement was held on 8th September 2012. The malayalam film fraternity is gearing up to prepare for yet another celebrity marriage. 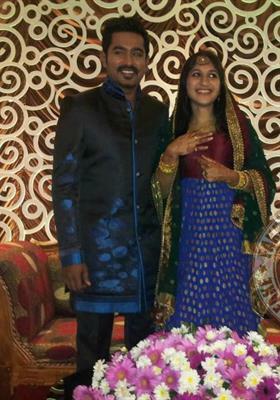 The most eligible bachelor in malayalam cinema Asif Ali is getting married to his fiancée Zama Mazreen on 26th May 2013. Being a BBA student, Zama is studying at the providence college, Kozhikode. The couple got engaged on 8th September last year and was waiting for the completion of Zama's studies. Zama who hails from Kannur was born as the only daughter to 'Thana Mehazil' A K T Asad and Mumtas. The engagement held at Flora Airport Hotel in Kochi was a private attended by only his family members and very close friends. Asif Ali is the eldest son of M.P. Shoukath Ali and Molly. M.P. Shoukath Ali, the former Municipal Chairman of Thodupuzha Municipality. Askar Ali, his younger brother too is passionate towards movies. Asif Ali being regarded as one the highly talented young actor in malayalam has been a part of various commercial hit movies including Traffic, Salt N' Pepper and Ordinary. Started his acting career with Ritu, Asif also appeared in movies like Bachelor Party, Ozhimuri, Jawan of Vellimala, Husbands in Goa, Kili Poyi and Red Wine. During the shoot of his ongoing project 'Honey Bee', the actor fell from the bike as it skid when he was racing. As the filming was to be wrapped up in three days, the shoot has been postponed for a week as Asif got injured. Asif who is attending the Mazhavillazhakil Amma mega stage show held at Sharjah will return back on 6th April. The marriage of Asi and Zama will be held at the Asif Ali's ancestral home at Thodupuzha. The marriage will be arranged conveniently which would have the blessings of their parents, relatives and close friends representing the film fraternity. The day after the marriage, Asif would be calling off a grand reception for his fans and members of malayalam film industry.